Harvesting one of the fruits of its capital campaign the day before unveiling the fundraising effort publicly (see “Capital-Campaign Compendium” for a summary of priorities), Harvard Business School officially broke ground for the Ruth Mulan Chu Chao Center on April 24. It will replace the demolished Kresge Hall. When completed in 2016, the new facility—with meeting, office, and dining facilities, plus classrooms—will complete a rebuilt and renovated residential executive-education quadrangle at the eastern edge of the school’s campus. 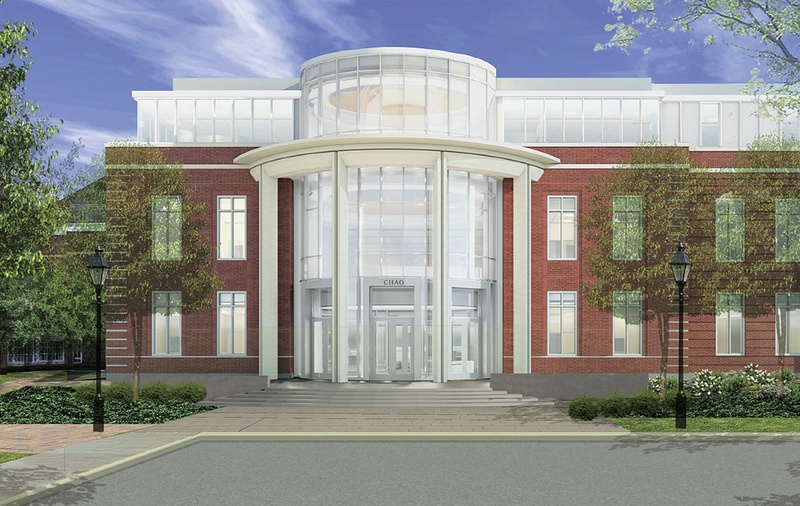 For further details, see http://harvardmagazine.com/2014/04/chao-center-at-harvard-business-school-groundbreaking. The Faculty of Arts and Sciences conferred the Hoopes Prize on 71 theses from among those nominated by professors and other advisers. Winners receive $4,000 (plus $1,000 for the adviser), and a place of pride, bound, on a special, prominent shelf in Lamont Library—an inspiration to rising young scholars. The honored theses this year ranged from Amsale Alemu’s “Tilling Imagined Land: Student Protest and Generational Conflict in Twentieth-Century Ethiopia” to Matthew Yarri’s “An Exoskeleton Device to Assist in Downhill Walking.” The complete list appears under the “Hoopes Prize” tab at http://prizes.fas.harvard.edu/icb/icb.do. Nearly 82 percent of the 2,023 candidates offered admission to the undergraduate class of 2018 accepted—a generationally high “yield” in line with last year’s result. As a result, just 15 to 20 wait-listed applicants are expected to gain admission. The admissions office reported that the entering class includes record numbers of African Americans (177) and Latinos (185), and the second-largest cohort of Asian Americans in College history. Stanford’s yield continued to rise sharply, reaching nearly 77 percent, as did Yale’s, climbing to 72 percent. According to the University’s annual disclosure, released in mid May, Harvard Management Company reported the following calendar-year 2012 compensation for its senior leadership and top-earning investment professionals: Jane L. Mendillo, president and CEO, $4.8 million; Robert A. Ettl, chief operating officer, $4.0 million; Andrew G. Wiltshire, head of alternative assets, $7.9 million; Alvaro Aguirre-Simunovic, natural-resources portfolio manager, $6.6 million; Stephen Blyth, head of public markets, $5.3 million; and Daniel Cummings, real-estate portfolio manager, $4.2 million. The University’s tax return for the fiscal year ended June 30, 2013, revealed that President Drew Faust earned $771,000 in salary plus other compensation of $270,000 (much of that attributable to use of the official presidential residence, Elmwood). Separately, her compensation for service on the board of directors of Staples Inc., reported in its proxy statement, was the standard cash fee for each board member of $75,000, plus stock awards of $175,000. For a full report, see http://harvardmagazine.com/ 2014/05/harvard-endowment-managers-executives-compensation. Coursera, the for-profit online-education competitor of the nonprofit Harvard-MIT edX partnership, announced a series of “learning hubs”—physical venues, with facilitators, where enrolled students can collaborate. The initial eight sites include Dominical University of California and the New York Public Library, plus six international locations that have Internet access (a limitation in some nations). Coursera also unveiled its “global translator community” to speed creation of course versions in multiple languages, since most of its enrolled students live in non-English-speaking countries.…Coursera co-founder and chairman Andrew Ng will simultaneously serve as chief scientist at Baidu, the Chinese Internet search engine—potentially, a valuable connection for Coursera in distributing its courses in that huge market for higher education.…Writing in his institution’s alumni magazine, Stanford president John Hennessy noted the low completion rates among students enrolled in massive open online courses, but highlighted the efficacy of “flipped classrooms” (with recorded lectures for viewing before class meetings), online analysis of student learning, and promising applications in executive and continuing education.…Berklee College of Music, a Boston-based member of edX, launched a fully online, accredited bachelor’s-degree program, in music business or music production, with a $14,500 annual tuition—about 40 percent of the tuition bill for a residential degree. Dartmouth received a $100-million anonymous gift, including a challenge fund that will raise total proceeds to $200 million, in support of 30 to 40 endowed interdisciplinary professorships, a new Society of Fellows for rising young scholars, expansion of its Thayer School of Engineering, experiential education, and new learning technologies.…Yale, joining Harvard (in Shanghai) and Stanford (Beijing), is opening a center in China (also in Beijing) for its visiting students and faculty, and for executive education.…The University of California at Los Angeles launched a $4.2-billion capital campaign, slightly edging the University of Michigan’s $4.0-billion goal as the largest fund drive by a public university. UCLA is emphasizing research and financial aid, which account for more than $3 billion of the resources sought; some $1.3 billion has been raised. 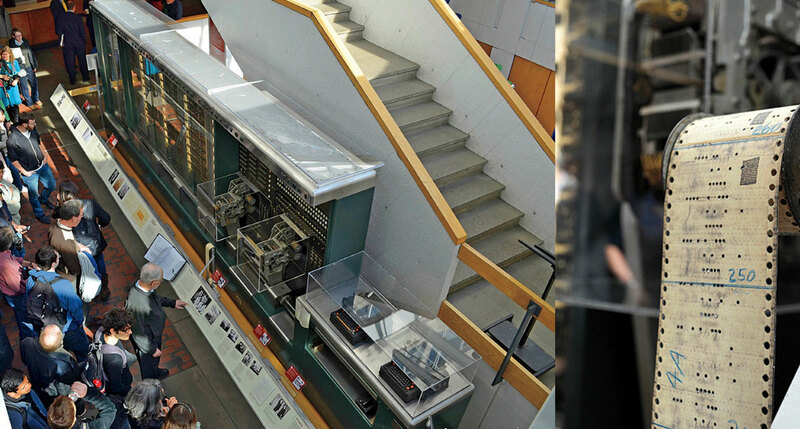 The 70-year-old Mark 1, the first programmable computer in the United States, was briefly turned on during an April ceremony for the reinstallation of the exhibit centered on the machine, conceived by Howard Aiken, Ph.D. ’39, S.D. ’65, during his graduate studies in phys­ics. “One of the things that I love about this machine is that it embodies, in a very direct, literal way, terms that we’re used to—like the ‘bug’, the ‘loop,’ and the ‘library,’ ” said Pellegrino University Professor Peter Galison. A real moth once laid low successor Mark II—the first actual bug found. Underwriting arts. University benefactor Paul Buttenwieser ’60, M.D. ’64—a former Overseer and 2010 Harvard Medalist—and his wife, Catherine, both supporters of the arts, have endowed the position of director of creative writing (within the department of English). The incumbent, Bret Johnston, becomes the first holder of the named directorship, which oversees coursework in fiction, poetry, nonfiction, screenwriting, and playwriting. Organizing outpost. Staff members at Dumbarton Oaks—Harvard’s center for Byzantine, Pre-Columbian, and garden and landscape studies, in Washington, D.C.—have voted to join the Harvard Union of Clerical and Technical Workers, effective this past April 1. This marks the first time since the HUCTW was formed in 1988 that a group of nonunion Harvard employees has voted to affiliate. Separately, an arbitrator ruled that 33 grants managers in various science departments and the Graduate School of Education are overtime-eligible employees and included in the HUCTW. Energy and environment. The concentration in environmental science and public policy has created a secondary field (for interested undergraduates concentrating in other disciplines) in energy and the environment, effective this coming fall. It requires one foundational course, plus three advanced courses in either humanities/social sciences, or natural sciences/engineering. Crimson cabinet. With Sylvia Mathews Burwell ’87 nominated as secretary of health and human services—joining Arne Duncan ’86 at education and Shaun Donovan ’87, M.Arch.-M.P.A. ’95 (moving from housing and urban development to the office of management and budget)—President Barack Obama, J.D. ’91, nearly had a Harvard College class trifecta in his cabinet. Miscellany. The Boston Globe disclosed in April that Crimson football coach Tim Murphy underwent emergency triple coronary bypass surgery this past February.…The American Repertory Theater’s productions of The Glass Menagerie (seven) and All the Way (two) were nominated for nine Tony Awards; winners were to be announced June 8, after this issue went to press.…As construction proceeded to accommodate Dunster House residents in swing space (at the repurposed Inn at Harvard and elsewhere), during the first whole-House renovation beginning this June, the Harvard-owned house at 8 Prescott Street was converted into the temporary new home for House masters displaced by the successive construction projects. The Expository Writing offices formerly located there have moved to Bow Street.…The Harvard Club of Boston is nearing the sale of the annex adjacent to its main clubhouse facility on Commonwealth Avenue; the space will be converted to condominiums.